Welcome back as we celebrate the 5th anniversary of the Bangkok Travelbug. This June we visit a very old market community in Samut Prakarn, a province that’s just south of Bangkok and a little over an hour by road. 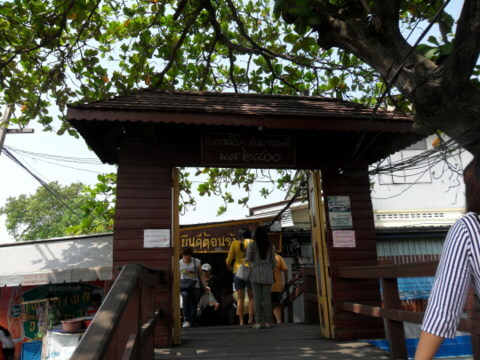 Like Bangkok, Samut Prakarn is on both banks of the Chao Phraya River. Suvarnabhumi International Airport is located in this province on the east bank. 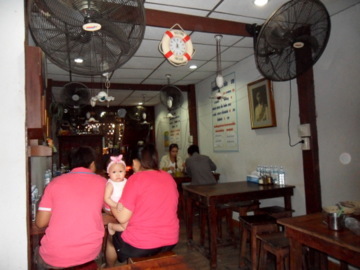 Bang Phli an old market community is a mere 7 km south of the airport. 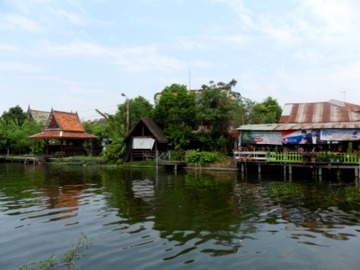 Samut Prakarn straddles the estuary of the Chao Phraya before the river enters the Gulf of Thailand. 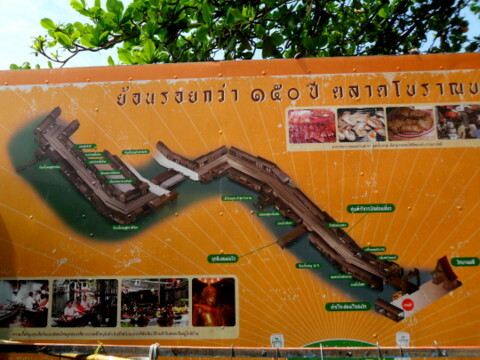 The estuary is about 5.5 km at its widest and the famous Paknam forts, built to defend against invasion by river, are on the west bank. 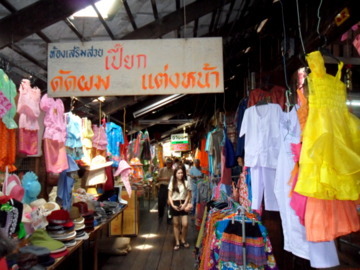 The Bang Phli market was opened 1857 by Chinese traders by the Samrong canal in the days when the waterways were the main thoroughfare. Many settled here and a community was born. 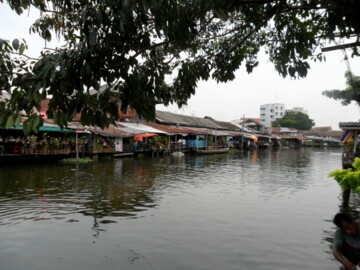 Back then boat vendors plied the canal to sell their wares and others came to the market for supplies. Trade was prosperous. 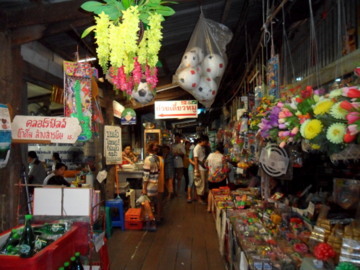 The market community is left in its original state with wooden walkways about 500 m long old linking the old wooden houses along the alleys. 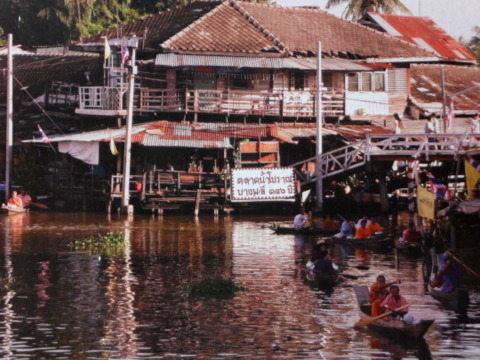 The residents are still living a traditional life with their homes and trade by the canal, their temple nearby and the friendly neighbourly atmosphere still pervades. Customs, traditions and festivals are passed down and practised through the generations, the most important being the Annual Lotus Throwing Festival (Rub Bua Festival – receiving the lotus). The festival is in honour of Luang Por Tor (1887 – 1981) a highly respected monk in Thailand. A statue of this monk is placed in a boat and rowed together with a procession of boats along the Samrong canal from Wat Bang Phli Yai Nai to Wat Bang Phli Yai Klang. People line both banks of the canal to throw lotus flowers at the boat. If the lotus flower lands in the boat with the statue, it means good luck and prosperity for the person who threw it. 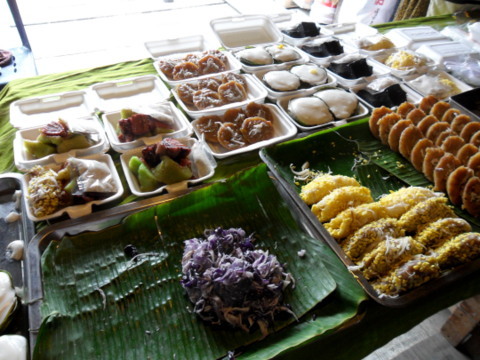 This festival takes place on the morning of the 14th day on the 11th lunar month (it’s full moon at night), sometime in October, the day before the end of the Buddhist Lent. 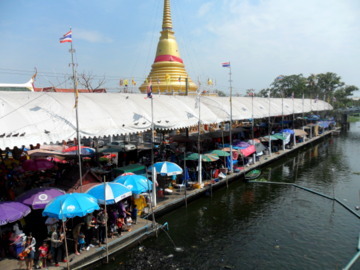 As I crossed the bridge over the Samrong canal, I saw the golden chedi of Wat Bang Phli Nai towering over the bustling market lining the banks of the canal. This however isn’t the old market. 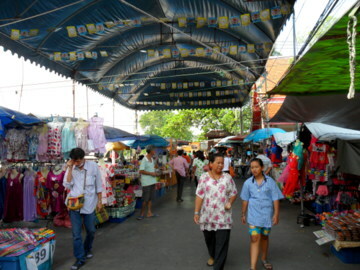 The old Bang Phli market is through this arch with the signboard at the side. As I strolled through the narrow alleys exploring the shops I felt as if I was in another world, the old world. 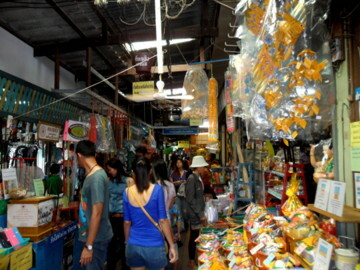 There are shops selling snacks, toys, flowers, alms hampers, fortune tellers, clothing, hairdressers, beauticians and of course food. 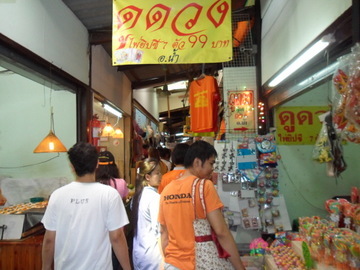 You can have your fortune told for 99 baht. 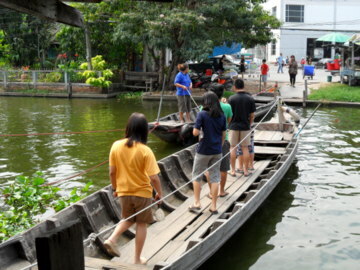 Fish feeding is a favourite activity at floating markets. 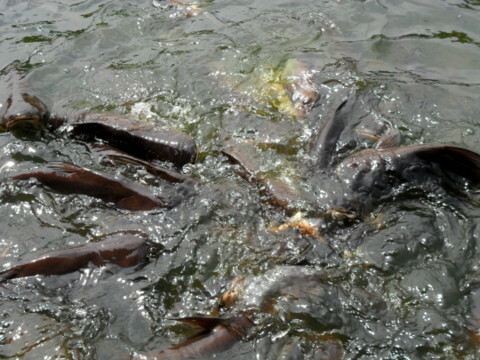 So buy some fish feed, take a seat and watch the fish in their feeding frenzy. I soon got hungry and stopped at this old shop for lunch. 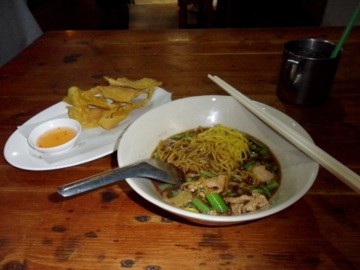 It was good value for money; a plate of noodle, deep-fried dumplings and a drink for 52 baht. Enjoying an ice cream was my favourite time of day as a boy. So I can understand the sheer joy of this boy at the sight of the ice cream vendor. It’s difficult to find an ice cream this way nowadays. You will need to go to an ice cream parlour in a mall which just isn’t the same. Or if you prefer other deserts there’s a wide variety here. The market is a place to enjoy the rustic scenery in relative peace. There is a mix of houses old and new, just stroll to a quiet section and enjoy the peace and serenity. At the end of the long alley, I reached this crossing consisting of two boats. This takes you across to the car park in the Big C supermarket. Toll is 1 baht. This is an ingenious improvisation; every time another boat needs to pass, the lady pulls one of the boats out of the way, to replace it after the passing boat has gone. The most convenient way of getting there is to take a skytrain to the Bearing skytrain terminal station of the Sukhumvit line. From there, take a "song taeow" (modified pick-ups that run on a fixed routes at fixed fares) going to Theparak Road. Not all of them go all the way to Bang Phli, the signs are in Thai, so ask first before boarding. On my way back, I found that there is a bus service going from Bang Phli to Bearing skytrain station. The bus has no number and the sign is in Thai, check if it’s going to Bearing. So the two passwords are "Bang Phli" and "Bearing". 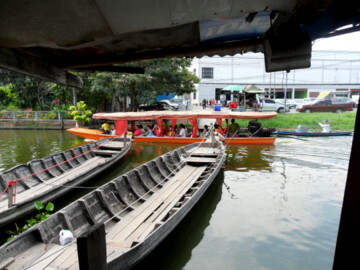 Or if you prefer, just take a taxi from Bearing station to the market and back. Stay updated with what’s new at Tour Bangkok Legacies. Copy the link below and paste it into your Google Reader, NetNewsWire or your favourite feed reader.